New York musicians have voted overhelmingly to depose Local 802 president Tino Gagliardi and replace him with a horn player, Adam Krauthamer. He beat the incumbent by a 2-1 margin at the ballot. Gagliardi has been an old-style union boss for nine years. What overthrew him was a perceived distance from the membership and widespread concerns about underfunding at the musicians’ pensions fund, concerns the American Federation of Musicians has persistently failed to allay. Krauthamer has promised transparency about the pension. Michael Cooper has more on the story at the parish sheet. 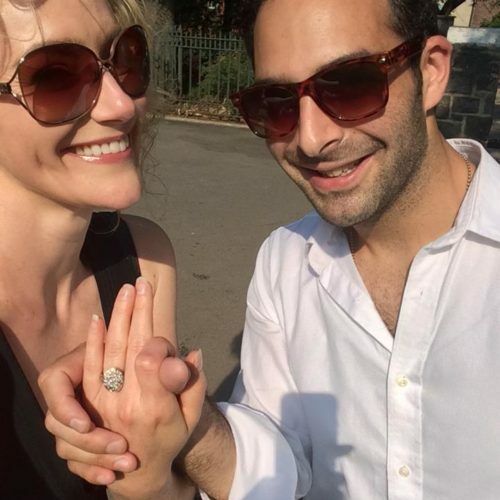 Krauthamer, 37, is married to the Broadway star Betsy Wolfe. Go Adam. We went jaw-to-jaw a few times when he was a student and we both survived. He is savvy and knows how to negotiate without belligerence. Solo horn in Mahler 5 with Zinman and Curtis Orch if my failing memory serves me well. Robert – Local 802 AFM/NY is the largest and wealthiest musicians’ local perhaps in the world. It’s far different Local 77 Philly and Local 6 SF. Its presidency is not an entry-level job. Adam never served on any bargaing unit committee and only started attending 802’s B’way Theatre Comm. when he decided to run. He’s never been to Cornell School of Labor Relations as has the current president and a few others in his administration. He’s also never been on either 802’s trial or executive boards. In going to DC saying he represented AFM’s pensioners, he lied since he was neither appointed nor elected – thereby turning off the very senators and congressmen involved in the US multi-employer defined benefit pension crisis. He was in actuality an ambassador without portfolio. His appeals to the very young musicians who have little or no knowledge of how Local 802, the AFM, and the pension fund works. He presents himself well but he’s nothing but a pied-piper. 802 will be lucky to survive his presidency. No question: local 802 is the AFM flagship. If 802 is to survive this change of leadership, it will depend on the experience of people like you, Mike, who would support the change. I hope that the outgoing President will become an ally and continue to offer his wisdom when asked. You’re right about my point of reference in the “hinterlands” of Philadelphia and San Francisco. I will leave further comment on AFM Local 802 to the experts. The central issue being the pension fun d is not going to be easy to fix despite the solutions the reformers are putting forth. But his efforts have certainly led to greater transparency with regards to the pension and increased communication from the AFM national leaders. I’ve been a member of Local 802 since 1971. They, and the entire A.F. M., have been at a “distance” for decades. Um, not exactly. Adam has promised to fix the pension. A promise he has no chance of fulfilling. But then, those who voted for him were uninformed to say the least. This is great news! I did not like the last administration because they ignored me and put me on their “pay no mind list”. I have been a member since 1967 when the Vietnam War was happening. I asked to get the opportunity to perform for the Christmas Party and was always ignored. My vote was cast to get rid of this creep. I hope things get better and the Union President gets closer to it’s members. “This creep” has nothing to do with what group plays for the annual holiday party. The selection is done by committee. Your response is typical of those with a personal axe to grind without a thought to your vote’s overall effect. has more to do with the AFM’s national leadership than any local presidency. The AFM’s utter failure to secure recording work in the ever growing video game industry is outrageous. Additionally, they have failed to create any usable contracts in other emerging markets: production music, sample libraries and related technologies. This incompetence is endangering the future of the AFM. They will be irrelevant to the next generation of musicians. Blah Blah Blah. There are perhaps four distinct tiers of union-related musicians in the region: (1) NY Phil/Met Opera players; (2) freelance semi-classical/broadway; (3) aspiring/struggling/student freelance semi-classical/broadway, likely not qualifying for benefits of any sort; (4) others, most obviously including jazz, who are definitely not benefiting from the union in any manner. What we’ll see play out in the coming year(s) is a growing chasm between tier (1) and all others. With luck, grit and determination Mr. Krauthamer will bridge such gap, but at the expense of tier (1) constituents (a notoriously grumpy and litigious lot, disinclined to aid their underprivileged peers). Your “tier 1” players are completely in a different world from everyone else in Local 802. What you call “tier 4” should also include club date players and recording musicians. Yes, I know that these areas are diminishing rapidly — I was in the club date sector back in the ’70s and early ’80s. I joined 802 in 1971 and I have a vague remembrance that there were about 30,000 members then. There are, obviously, a lot less today. There is less live music in NY City each year, for example there used to be 12 free-lance classical orchestras in the 802 jurisdiction; now there are 7 or 8. The club date business is dying because today’s young people — bar mitzvahs and/or weddings – want a DJ, not 4 guys in tuxedos playing Gershwin and Berlin.